Ontario Shores now has its orders from the Ministry of Labour. It’s been almost a year since staff at the Whitby mental health centre went public with their concerns about violence at the Centre, expressing concern and frustration about a lack of meaningful action by their employer. For all the activity Ontario Shores has shown to date, little has changed in the monthly statistics that show staff being assaulted on an almost daily basis. Now Ontario Shores Centre for Mental Health Sciences has a very detailed prescription to follow from the Ministry of Labour. Limited in its scope, the Ministry of Labour is not in a position to evaluate the impact of cuts to programming at the Centre on the behavior of those in their care. However, the recommendations to protect workers are significant. “Interviews with workers suggest the employer’s workplace violence policy and program is not protecting workers from injury and/or preventing incidents of workplace violence,” the May fieldwork report states. The Ministry noted workers were unclear about the role of external agencies, including the police for which staff at the Centre said they were discouraged from calling. “Based on interviews with employees and management, the inspector found a number of deficiencies, in the development of measures and procedures, in consultation with the JHSC (Joint Health and Safety Committee), to protect workers from violence and harassment in the workplace,” the document states. It may have taken a long time to get here, but the Ministry of Labour is now aggressive about timelines to implement the 15 orders issued to Ontario Shores. That includes detailed compliance plans by the end of May to carry out risk assessments of all outpatient clinics and inpatient units. They have until June 24 to put into a place a system where information is shared with impacted workers related to the risk of violence from a person with a known history of such behaviour. The hospital will also be required to take precautions around ID badges and “confinement” of long hair or jewelry that may present a hazard by the end of May. By the end of July Ontario Shores is expected to put together measures and procedures for workers providing direct care to individuals who become agitated, aggressive and/or experience episodes of unpredictable behavior. As well, the hospital is expected to better prepare workers for code white alarms and physical intervention in these situations, including when individuals are responding to incidents involving weapons. A behavioral crisis/safety plan is to be put in place for individuals who are known to have assaulted workers in the past. By the end of August Ontario Shores is expected to “provide information and instruction to workers on the content of the workplace violence policy and program.” That includes reporting incidents. The orders note that workers were unaware of how to summon immediate assistance in areas where the personal alarms were not operable or are ineffective in summoning immediate assistance. In at least two situations it was other patients who intervened in an attempt to protect the worker. The Ministry of Labour also noted that some workers they interviewed were unaware of the content of the workplace violence policy and program including existing measures and procedures in place to protect them. By the end of October Ontario Shores will have had to provide all workers, managers and supervisors mandatory crisis intervention training. The Ministry of Labour will later conduct a comprehensive inspection to determine if compliance with the orders was achieved. Unfortunately there is no counterpart to this investigation by the Ministry of Health. Last December OPSEU wrote to the Minister of Health asking that an investigator be appointed to look into the impact of changes at Ontario Shores. The Minister told us that the LHIN was asked to look into our concerns, although the Central East LHIN has never approached us or the OPSEU local at Ontario Shores about these complaints. This entry was posted in Uncategorized and tagged Ministry of Labour Orders, Ontario Shores. Bookmark the permalink. I agree 100% with Dr. Heather Stuart,“indicating that mental illness is not a sufficient cause for the occurrence of violence.” You take away the budget for on and off ward activities along with abrupt suspension of smoking for new involuntary patients and you will see the slow escalation of a patient possibly ending in a violent incident. My concern is that OS will turn this into a paper exercise just to pacify The Ministry of Labour. As bullying is a huge culture within the walls of this organization, one can only assume that employees will be silenced further as the pressure of deadlines loom. And as they say in psychology: “past behaviour is the best predictor of future behaviour” … I suspect this will not be the last time OS is on the radar of The Ministry. This organization needs a huge enema of their “frontline” managers and administrators. 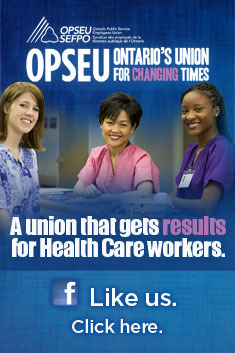 Keep up the good work OPSEU team at OS. Cheers.